Item # 20046 Price: $175 USD Tell me more! A beautiful set of bracelets from the Victorian era. 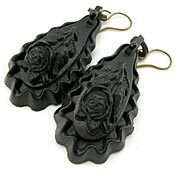 Created from brass and stamped with an elaborate pattern of leaves and flowers. These bracelets appear to have been created from a long strip of brass that was stamped with a repeating pattern and then cut to the appropriate lengths. Extremely Fine condition with no damage, dents, bends or repairs.Not hallmarked. Item # 10809 Price: SOLD $125 USD Tell me more! 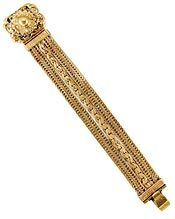 Victorian gold over brass bracelet with elaborately embossed and engraved clasp. The five rows of chain are not connected to one another but hang freely. The bracelet closes with a push clasp that is in excellent working condition. Overall condition, Extremely Fine with no damage or repairs. Item # 10877 Price: $125 USD Tell me more! 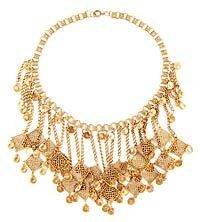 A necklace that will bring out the gypsy in you. 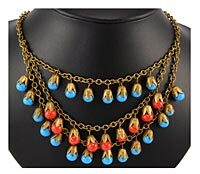 This necklace has the feel of the Arts and Crafts period of the late 19th century. Created from brass but with more of a copper color to it. From the elaborately stamped bookchain a profusion of filigree squares and round cutouts dangle from cable chains. The necklace chimes softly when it moves. Item # 10784 Price: SOLD $165 USD Tell me more! 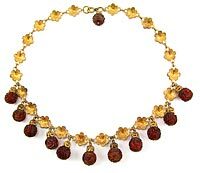 A delightful Victorian necklace comprised of gilded brass flowers and genuine carved amber drops. This necklace is pictured in Popular Jewelry by Roseann Ettinger. Extremely Fine condition. Not hallmarked. Item # 10807 Price: $275 USD Tell me more! A most unique Victorian era bracelet created in the Etruscan Revival style. Extremely Fine condition with no damage or repairs to the metal. Although the ends are open, it is only slightly adjustable in size. To put the bracelet on, the ends are twisted away from one another to create the opening. Not hallmarked. Item #10806 Price: $325 USD Tell me more!